Aramath Pro Cup cue ball as seen on ESPN. This is one of the most sought-after items in billiards. This ball has six red dots on its surface. 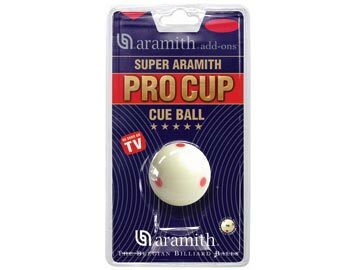 One advantage of the "pro cup" cue ball is that it makes it easy to "visualize the rotation" of the ball. You instantly see any inconsistencies in your shot. The ball is regulation 2-1/4" in diameter and is regulation weight.